One to one conversation with a person (interview) is one of the easiest user research techniques. Sitting, talking to a person, what could be easier, right? No, not really. If you want to get real insight - you'll need to learn a lot before you master interviewing skills. What do you really want to find out? Come with a plan, frame conversation, inform a person upfront about topics you want to discuss. Goals need to be aligned between yourself and a user, don't hide it within too general descriptions. In most cases, you'd want to interview both user and buying personas, separately of course. An example of a bad interview goal: "Let's talk about how you hire employees". It's too general and lacks a target persona to speak to. An example of a better interview goal: "Can I talk for an hour with your HR manager about the process and tools she's using for hiring?". In 9 cases out of 10, HR manager will appear prepared for an interview and you will use her and your time in the most efficient manner. Old fashioned? Yes. Has drawbacks? Yes. Still useful? Sure! Phone interviews still the most inexpensive way to get some feedback from a user. Everybody has a phone, so you can stay in your warm office, get your headset on and call your users/customers. Minuses? You will need to rely only on verbal communication, which is only a part of an information you can get. Instant messaging systems are extremely popular today. Skype, Facebook Messenger, Google Hangouts, WhatsApp, Viber and so on. People use them every day for both private and professional matters. You can use them too for performing user interviews. This option obviously has a lot of disadvantages, but at least you will not need to do notes. Remember that most of those IM systems support voice and video connections, which will be much more efficient than just bare text. Probably the best way to perform user interview. It allows an interviewer to get the most information. However, it is the most expensive and time-consuming way. Surely you can combine mediums to increase your reach. Whatever way you'll choose remember to record an interview for future analysis. 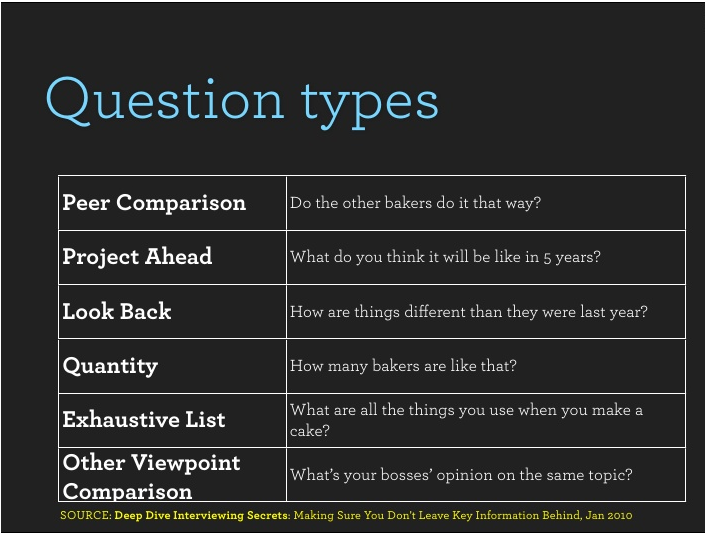 Did you know that asking closed-ended questions is not really valuable? Yes or no? Questions you ask should encourage a person to say more than just a couple of words. Encourage a person to tell you a story. Try to get a glance of emotions that person felt like in a story. And if your interviewee stopped talking - let the silence be for few moments. In most of the cases, a person you are interviewing will continue talking. We naturally don't like silence in a conversation, especially when talking with strangers. Don't be the first to fill the silence gap, it will be filled by your interviewee, allowing you to get even more feedback. Avoid being patronizing. Be perceptive - not judging. Remember, user interview is not a right time to defend your product or teach how to use it. If your user tells you about problems she had using your product, don't waste time explaining where she made an error or how she misunderstood the manual. Always assume that it's your product that has an issue, not the user. "Picture worth a thousand words"
Interview, surprisingly, is not only about talking. Some very valuable feedback participant is willing to give you will not be articulated. Ask your participant to perform some tasks related to the topic of the interview. Let's imagine you're building a new "task list" kind of app. Ask the interviewee to show you how she would memorize a thing she needs to buy tomorrow. Ask her to show you how would she communicate grocery list to her husband. Ask a person to comment and reason what she's doing. 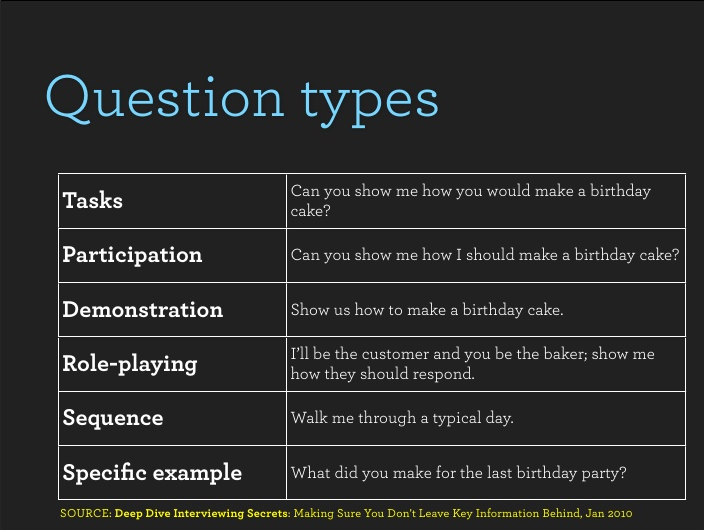 Exercises (or tasks) like that may reveal much more insights than questions do. By the end of an interview don't forget to answer this question: what's now? Somebody just spent an hour of his or her time trying to help you and you need to give something back. It's not about rewards - it's about follow up. 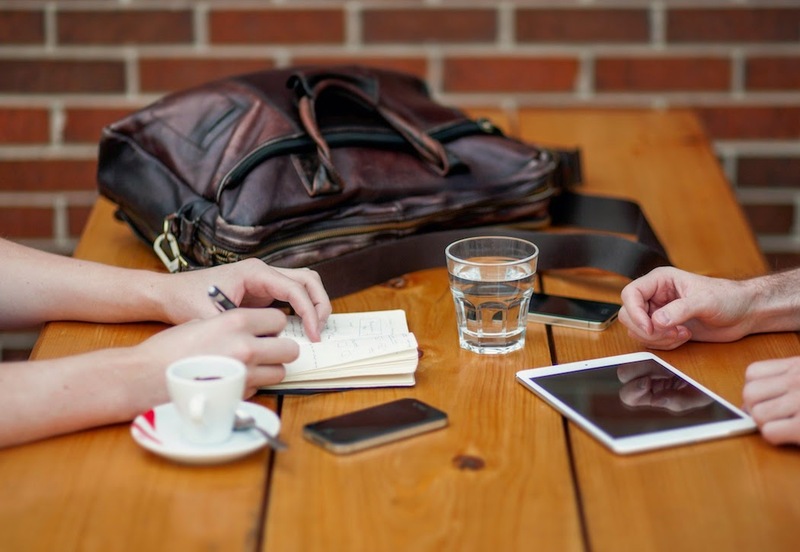 Stay in touch with your interviewee and come back to show results of their feedback. You may return with shiny pictures, a prototype or a ready product. Good practice is to agree on regular touch points during the product development. So you'll be able to validate if the feedback you received was understood and built well by a development team.